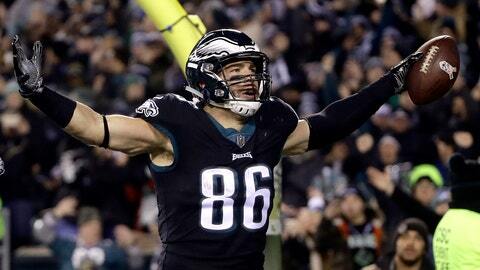 PHILADELPHIA (AP) — Zach Ertz caught the go-ahead touchdown pass in Philadelphia’s victory over New England in the Super Bowl and hasn’t stopped making receptions. Ertz is on pace to have a record-setting season for tight ends. Carson Wentz’s favorite target has 75 catches for 789 yards and five touchdowns in nine games. If he keeps it up, Ertz will finish with 133 catches and 1,402 yards. He would shatter Jason Witten’s record of 110 catches set in 2012 and break Rob Gronkowski’s mark of 1,327 yards receiving in 2011. “Zach is a tough cover for whoever they put on him and we trust him to make plays and get open and he does a good job of it,” Wentz said. Ertz had 14 receptions for 145 yards and two TDs but the Eagles lost to Dallas 27-20 on Sunday Night Football. DREW’S DAY: Drew Brees threw his 509th touchdown pass to move past Brett Favre for second on the all-time list. Peyton Manning is first with 539. Tom Brady has 505. Brees also completed 22 of 25 passes (88 percent) in New Orleans’ 51-14 win at Cincinnati. His 77.3 completion percentage this season is better than his record-setting mark of 72 percent last year. MORE ACCURACY: Five quarterbacks have a completion percentage over 70 percent: Brees, Kirk Cousins (71.3), Derek Carr (71.3), Matt Ryan (71.1) and Wentz (71.0). It had happened only nine times previously in NFL history. CAPTAIN ANDREW: Andrew Luck has at least three TD passes in six consecutive games for the Colts. Only Brady and Peyton Manning had a similar streak. Brady reached 10 games in 2007 and Manning did it in eight straight in 2004. IMPRESSIVE QBS: Pittsburgh’s Ben Roethlisberger (158.3), Cleveland’s Baker Mayfield (151.2), Brees (150.4) and Chicago’s Mitchell Trubisky (148.6) had a passer rating over 145 (minimum 20 attempts) in Week 10, surpassing the previous high of three done four times previously. MORE MAHOMES: Patrick Mahomes broke Len Dawson’s Chiefs single-season record by throwing his NFL-leading 31st TD pass in only his 10th game. TB12 MILESTONE: Brady played his 300th game, including playoffs. He’s second behind Favre, who played in 326 games. ROOKIE’S RUN: Nick Chubb’s 92-yard touchdown run in Cleveland’s win over Atlanta was the longest rushing TD in franchise history and the second-longest by a rookie in NFL history. Bobby Gage had a 97-yard TD run for the Steelers as a rookie in 1949. T.O. TOPPED: Larry Fitzgerald passed Terrell Owens for second place on the all-time list for most yards receiving. Fitzgerald has 15,952. Jerry Rice is first with 22,895. MOVE OVER, MEGATRON: Julio Jones reached 10,000 yards receiving faster than anyone, doing it in his 104th game. Calvin Johnson had been the fastest at 115 games. ODELL’S OLD NEWS: Saints wide receiver Michael Thomas had eight catches for 70 yards and two TDs against the Bengals. His 274 catches through 40 career games is most at this point of a career. Odell Beckham Jr. had 266 receptions in his first 40 games. 600 CLUB: The Redskins need one more win to become the fifth franchise in league history to have 600 regular-season wins, joining the Bears (755 wins), Packers (741), Giants (689) and Steelers (620).